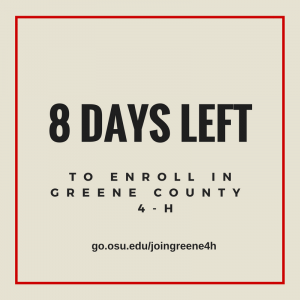 Online enrollment is open for Greene County 4-H members. After talking with a club leader to ensure meeting club requirements, members are open to enroll for 2019. We are currently at 83 enrolled members for 2019. Deadline is March 1. The 200th approved member will win a 4-H goodie bag and a Subway gift card. All projects listed when you click submit are what you would be enrolled in for 2019. If you are not taking a project that you took last year, that project needs deleted. If you are changing clubs, please delete that club prior to submitting. If you need to order books, you must contact our office. We place orders every Friday. 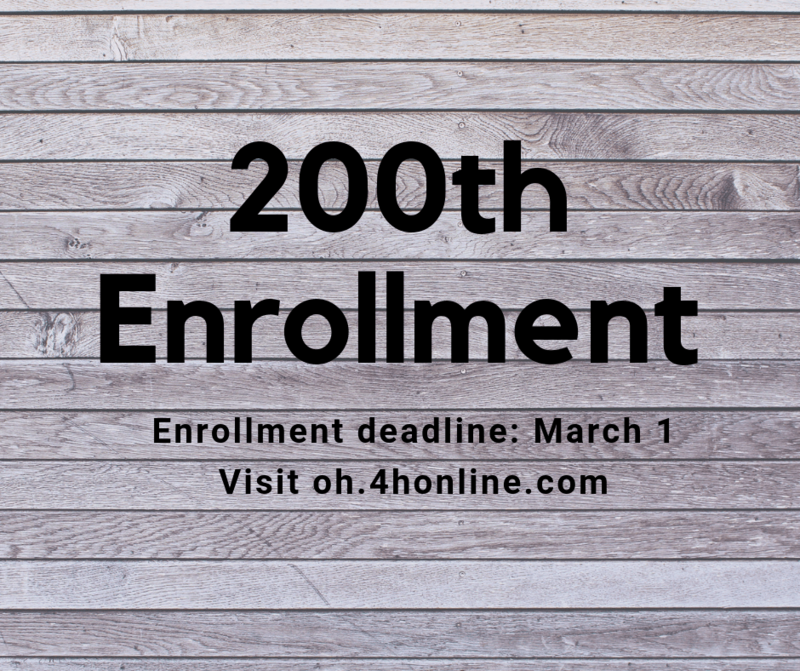 Visit the website for some tips on completing enrollment. We are looking forward to a great 4-H year! Maybe you will be the 200th approved member! 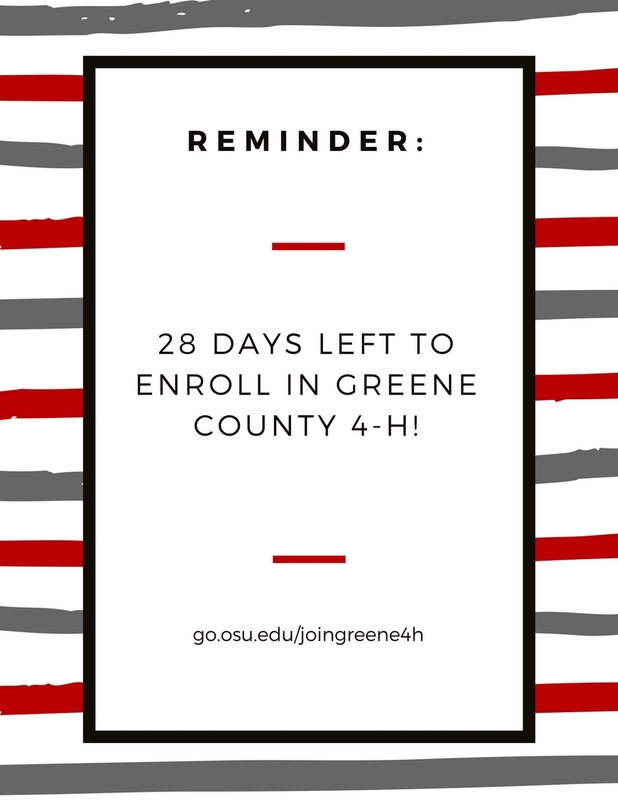 Let’s complete the 4-H Online Enrollment for 2019! 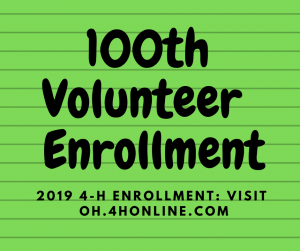 As a reminder, all volunteers need to update their information by visiting oh.4honline.com. We are currently at 38 volunteers who have completed their enrollment for 2019. In order to be approved, volunteers need to be cleared with current background check and have completed a training (in-person or online). The deadline to update this in March 1. The 100th approved volunteer will win a 4-H goodie bag and a Subway gift card. 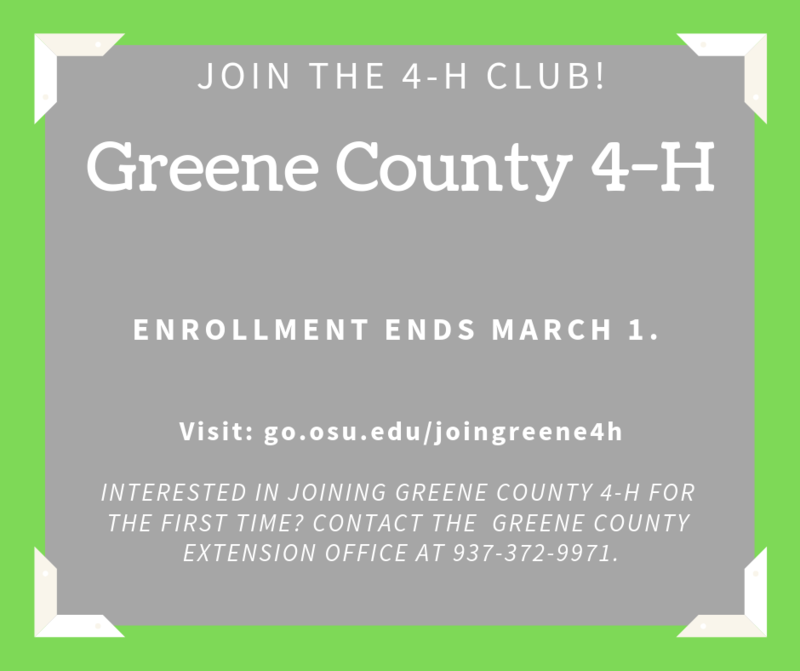 The Greene County Extension Office is excited to announce that we are accepting 4-H enrollments to the 4-H Online enrollment system. 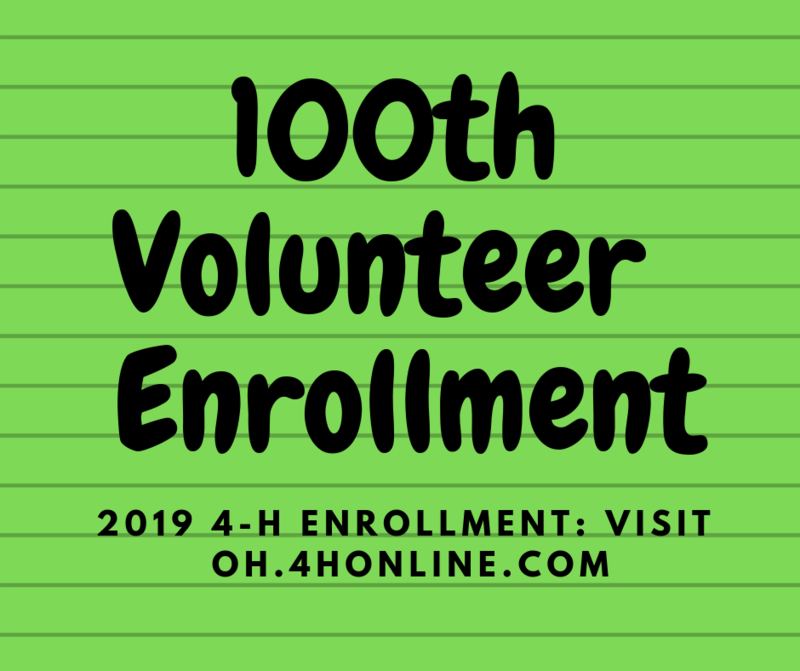 Please log on to oh.4honline.com to enroll in 4-H. All families will need to review their members’ information and re-enroll for 2019 via 4-HOnline. Please make sure you delete any projects that you from last year that you are not taking this year. For steps to re-enroll, please click here or visit here for helpful videos. Choose a club which meets in your area, a club your child’s friends are in, or contact the Extension Office for more information. Contact the club advisor. 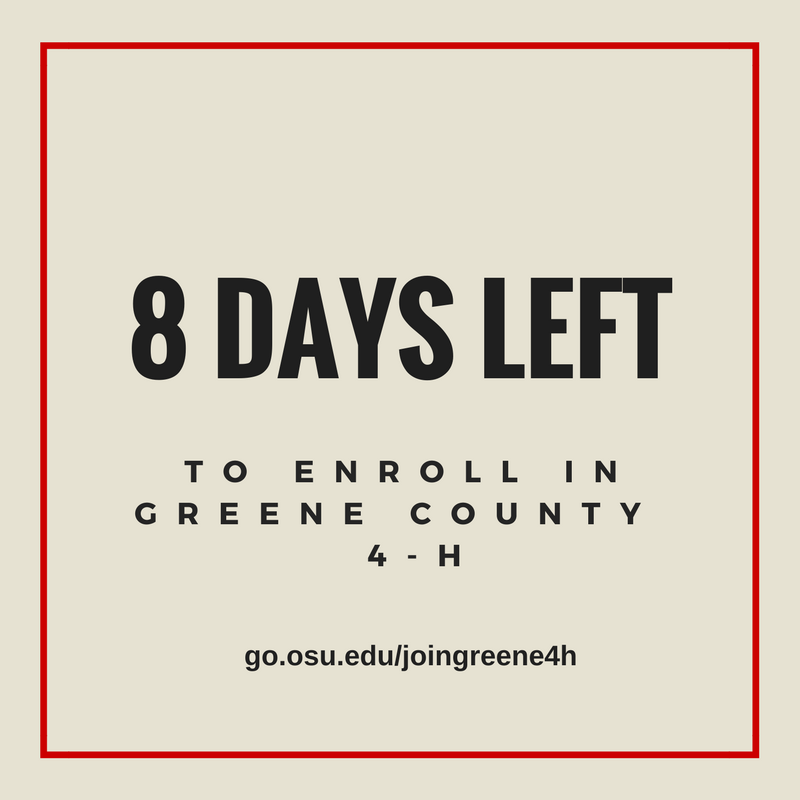 Youth may join 4-H at any time; however, to participate in the Greene County Fair, they must be enrolled by March 1. 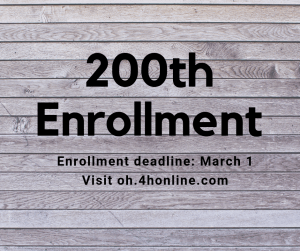 Complete an online enrollment form at oh.4honline.com and select “I need to setup a profile.” OR contact the Extension Office for additional enrollment information. Please complete your enrollment and update any information as needed. Complete the online training or attend an in-person training. When training is completed, we will approve you. Trainings must be completed by February 28 for the 2019 4-H year. Please let us know if you have any questions. Feel free to stop by during business hours to complete this if that is easier for you. 4-H enrollment is due next Thursday, March 8. Please complete all online paperwork using oh.4honline.com . Let us know if you have any problems or questions! Please remember that the online enrollment system works with Safari, Firefox or Google Chrome, not Internet Explorer. Volunteers, have you updated your profile? Please do so! 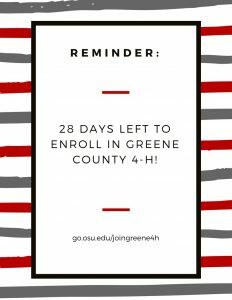 Greene County 4-H is utilizing online enrollments for 2018. 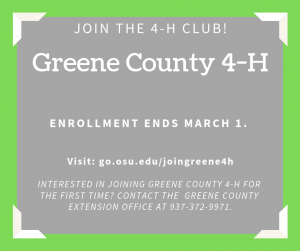 Beginning this year, please log on to oh.4honline.com to enroll in 4-H. All families will need to review their members’ information and re-enroll for 2018 via 4-H Online. Please share this with anyone who might be interested in joining 4-H! Just a reminder that we have another 4-H volunteer training at 5:00 followed by 4-H Online Club Advisor training at 6, tomorrow, Wednesday, January 10 at the Extension Office. If you have a laptop, you might want to bring it. This might help so you can follow along. We can help get everyone connected to the internet.